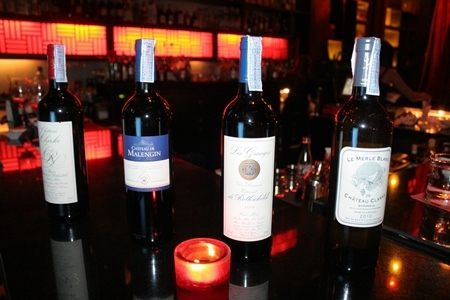 Baron Edmond de Rothschild was represented in Pattaya’s Mantra restaurant at a wine dinner featuring some of the many and varied wines to come under the “Compagnie Vinicole Baron Edmond de Rothschild” label. It was the French branch of the Rothschild family which purchased the Chateau Lafite in 1868 resulting in some world famous wines. The wine holdings were then increased with Baron Edmond’s purchase of two ‘Crus Bourgeois’, including the Chateau Clarke vineyards which were completely restored to their former glory by the Rothschild family in the 1970’s. 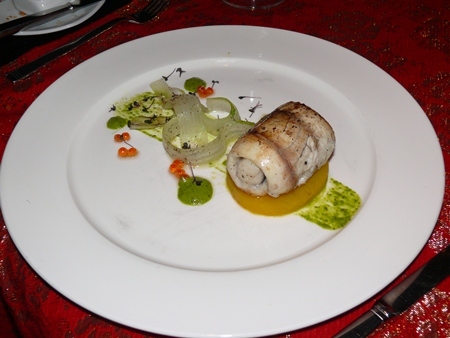 One choice for the main course was sea bass roulade with saffron potato fondant, salsa verde and baby red cabbage continuing with the Merle Blanc 2010. The official representative was Florent Mougin, the Asia-Pacific export manager for the Compagnie Vinicole Baron Edmond de Rothschild, who in an exclusive interview on PMTV elaborated on some of the varied areas the company was involved in (France, South Africa and Argentina), and the private banking right through to boat races! A very far-reaching conglomerate. Florent also put paid to the ‘room temperature’ debate for red wines, stating the temperature for reds should be 17-18 degrees Celsius, and whites at 12 degrees C. Now you know, set your fridges accordingly! Rothschild wines under the “Compagnie Vinicole Baron Edmond de Rothschild” label are lined up and ready for the evening guests. However, we had come to sample some of the wines, with a menu designed by the Amari’s Executive Chef Leonard Faust to complement the wines. The first of five courses was a foie gras mousse terrine served with pickled beets, tomato tartar and micro red bamboo radish. Now usually, the first course is served with a white wine, but in this case it was a medium bodied red Les Granges des Domaines Baron Edmond de Rothschild, Haut Medoc, 2009. This course and the accompanying wine had everyone thirsting for the second course. 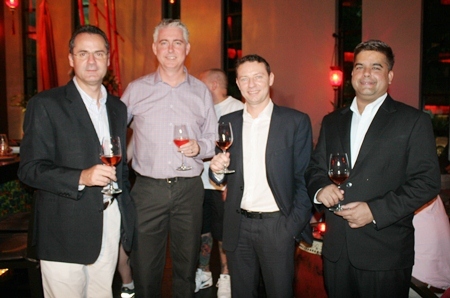 (L to R) Richard Margo, resident manager of Amari Orchid Pattaya; Brendan Daly, general manager of Amari Orchid Pattaya; Florent Mougin, Asia-Pacific export manager for the Compagnie Vinicole Baron Edmond de Rothschild and Tony Malhotra deputy MD of Pattaya Mail Media Group, at the pre-dinner cocktail. This offering from Chef Leonard was a Jerusalem artichoke and cauliflower volute with prawn, dory mousseline and green oil. A superb soup, accompanied by a Merle Blanc de Chateau Clarke, 2010. This was a superb wine, absolutely correct for the volute. Som Corness readies herself to chose from the assortment of cheeses. The main course was a choice of roast lamb saddle with Parma ham, apricot and strawberry balsamic risotto, taken with a Chateau de Malengin, Puisseguin St. Emilion 2009, or sea bass roulade with saffron potato fondant, salsa verde and baby red cabbage continuing with the Merle Blanc 2010. Madame chose the lamb, and I went with the sea bass. The saddle cut does leave some fatty areas, but this was still a very pleasant dish, and the St. Emilion was well received. For me, this was a wonderful innovative way to serve sea bass, and the continuation of the Merle Blanc was no hardship! The next course was a cheese assortment, and here, the fourth cheese, a blue (next time please give us the names of each cheese, Chef Leonard) and this spicy, fizzy combination with the Chateau Clarke, Baron Edmond de Rothschild, Listrac 2005 was a full-bodied red, but even Florent Mougin admitted that any wine would be struggling against the onslaught of tastes offered by the blue cheese. And so to the final course of a bitter chocolate and white chocolate terrine with cherry Chantilly, taken with a Ferreira Port Tawny, an interesting wine with a long finish and not too sweet as to overpower the chocolate terrines. A farewell drink at the Mantra’s cocktail bar and it was home after another memorable evening. If you have not been to some of the Mantra’s special events, then you should treat yourself to something that you will talk about for weeks to come. Mantra’s event is a special evening of jazz music with the Bangkok Symphony Orchestra Foundation Jazz Quartet featuring guest singer Karista Yenpoonsuk and lead keyboard player Bhudinant Deeswasmongkol. This will take place beginning at 7.30 p.m. on Saturday May 18. 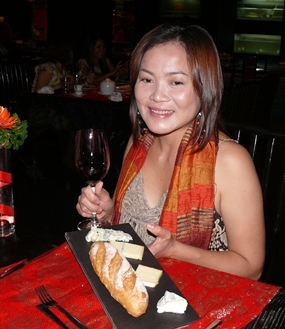 To book seats email: [email protected] mantra-pattaya.com. Mantra Restaurant and Bar, Pattaya Beach Road (just before the corner), open seven days, secure valet parking, telephone 038 429 591. 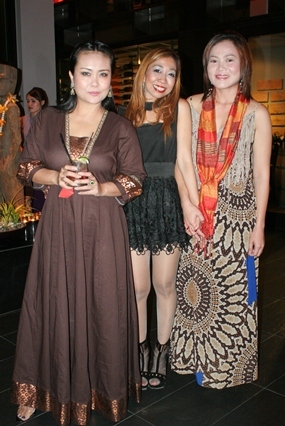 Mantra Social Director Supparatch ‘Amy’ Piyawatcharapun (center) welcomes Rungratree Thongsaai (left) and Som Corness (right) to the fabulous evening at the magnificent restaurant & bar.